The four and a half mile East Suffolk Railway single branch line from Saxmundham to Leiston was opened on 1 June 1859. Plans for a four mile extension to Aldborough had been lodged with the Board of Trade by 30 November 1858. The extension and terminus station were opened on 12 April 1860. The East Suffolk Railway was initially operated by Eastern Counties Railways which merged with other companies in 1862 to form the Great Eastern Railway. 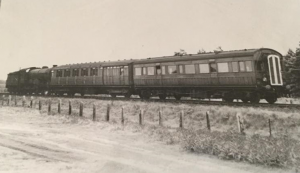 They intended to continue the line from Aldeburgh station to Slaughden and to link the line to the proposed Aldeburgh Pier but neither materialised. In 1923, the London and North Eastern Railway took over operation of services. Last Steam Train from Aldeburgh to Liverpool Street Station. Image courtesy of Pamela Smith. Also see the ‘Last Train from Aldeburgh’ film. If you know of any other Aldeburgh men employed by the railway, or men from elsewhere who worked there, please contact us.